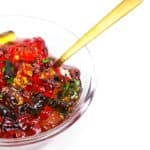 Fill an airtight, glass container with the gummy candy. Top with enough rum to cover the candies. Cover and refrigerate for 12 to 24 hours. Drain any excess rum, and serve with spoons or toothpicks.